I don’t spend a lot of time thinking about my creative process unless, of course, I run out of it. I will admit, I have moments where I don’t even have bad ideas, let alone good ones. It is like I open the door to my creativity closet, and the shelves are empty. 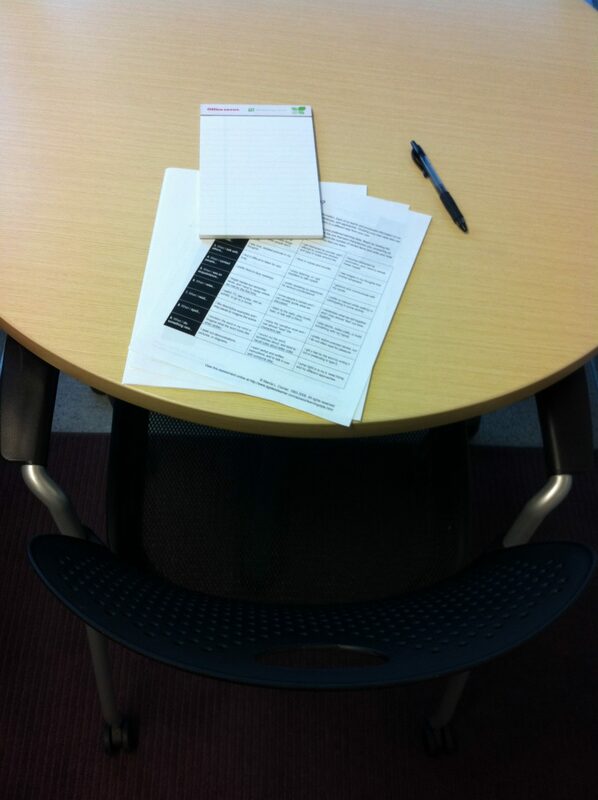 What Does Your Room Set-up Say About Your Training Presentation? As your learners enter the room, they’re already judging you and your presentation. What message(s) are you sending them as they walk into the meeting space? The content and delivery of your presentation are only a fraction of the work. Making sure the little things are taken care of can set the tone for the entire day. 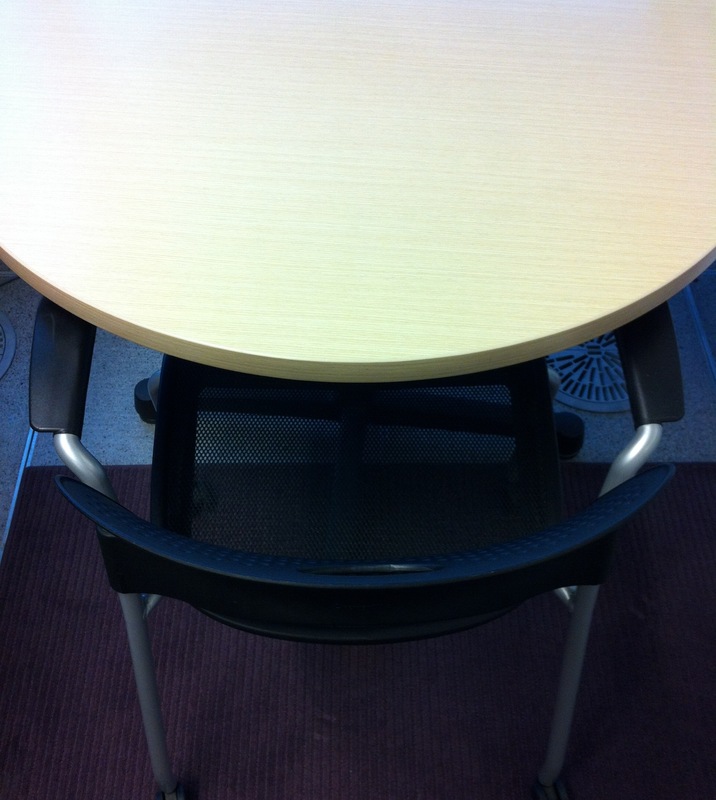 The message I receive when I walk into a room like photo #1 is: well, the table is clean. I wonder if there are any handouts. Shoot, I think I forgot a pen. I hope I can remember everything the speaker talks about. 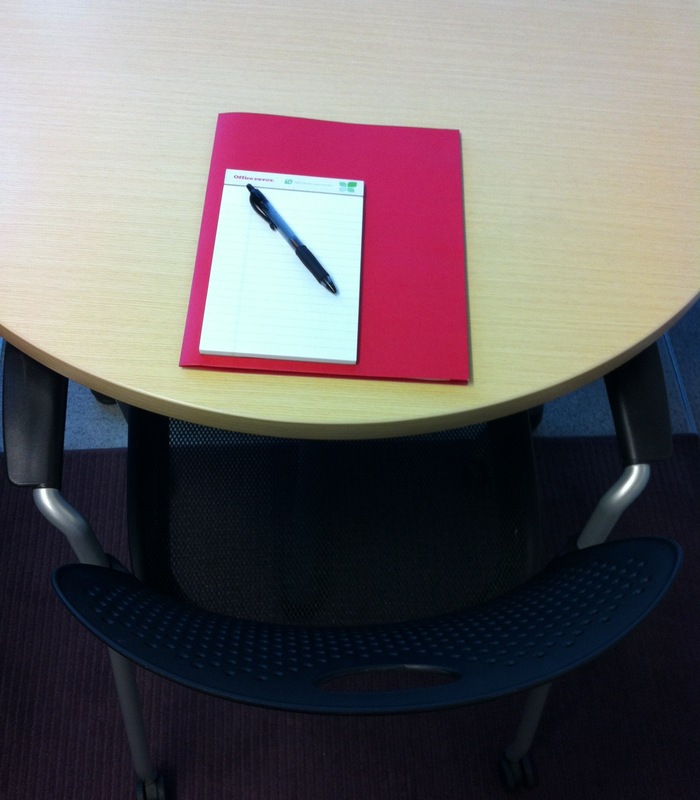 When I walk into a room and see something resembling photo #2 I think: how nice, someone threw some notepads and pens on the table. Wonder if there will be anything noteworthy to jot down. 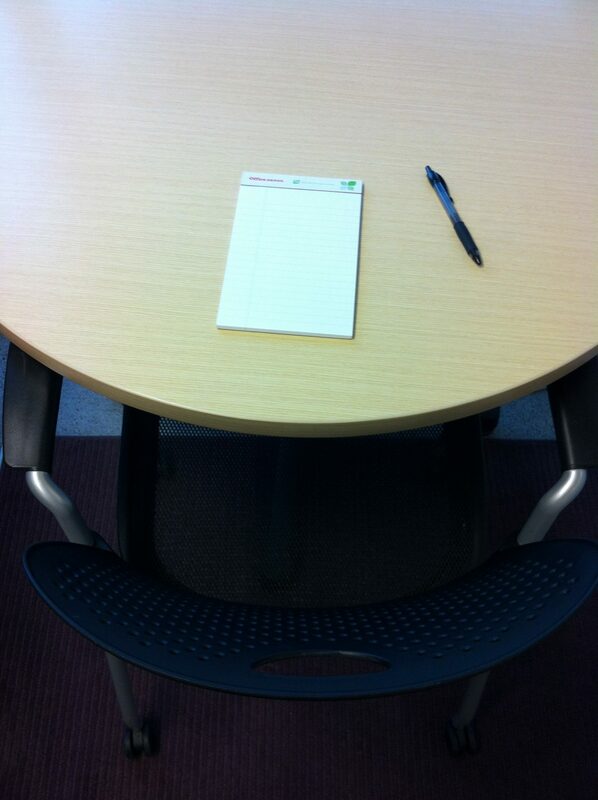 A table set like photo #3 makes me think: how nice, someone threw some handouts and a pen and pad on the table. Wonder if they were in a hurry this morning, or if they’ll be throwing stuff at us – figuratively or literally – all through the session. In photo #4, I can finally begin to appreciate the preparation that someone went through in advance of a presentation – they not only created materials but have offered a place for everything to be neatly kept. When I go home, I won’t just throw my handouts in a pile on my desk (or throw them away); I now have a folder where I can keep them together and file them if necessary. Photo #5 goes the extra mile. A presenter has obviously put time and thought into the presentation and how the materials are presented… even down to creating a personalized folder with my name on it! I’m willing to give this presenter the benefit of the doubt as we get started because this looks like a pretty professional set up! 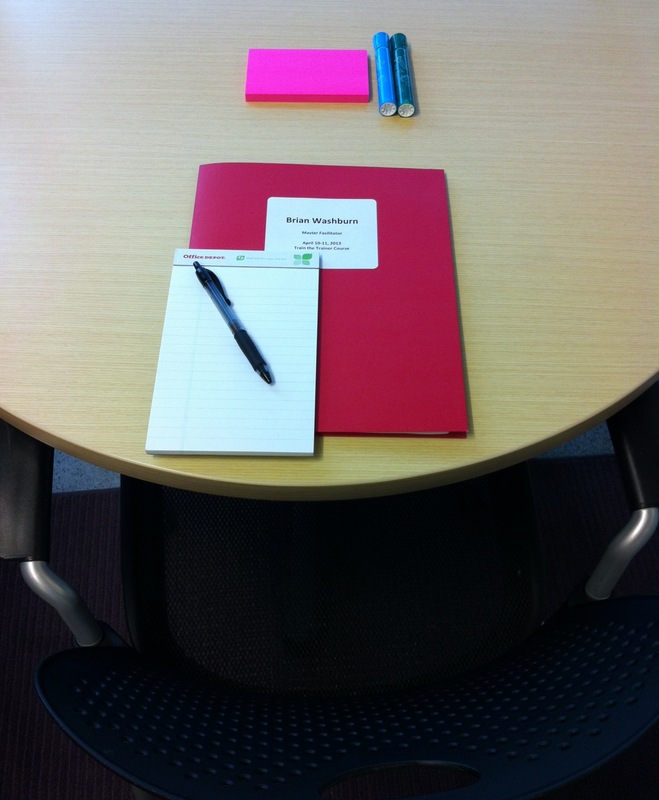 Look, the presenter even provided post-it notes and markers… wonder if we’ll be involved in activities and if we’ll be allowed to share our thoughts. I better get ready for this session. Is Your Training Icebreaker Any Good? Question 1: Is your icebreaker relevant? Fun and relevant don’t have to be mutually exclusive. When I used to facilitate workshops for professionals working in the foster care system, I used to begin sessions by asking people their names, positions, organizations, tenure and favorite ice cream. Asking tenure as part of the icebreaking question set can be helpful, especially if you add everyone’s experience together (“Wow, we have a combined 147 years of training experience in this room.